Home > When Can I Plant Flowering Plants in Spring? There is such a wide selection of ornamental annuals with different cultural needs that many gardeners do not know when to plant in the spring. Annual flowers differ in their tolerance to cold weather and frost. Some annuals are cold tolerant and will survive a light frost. Cold tolerant annuals can be planted before the last frost date. Generally, the genetic cold tolerance of plants varies depending on where the plant originates. Annuals native to tropical regions are sensitive to cold soil temperatures and are easily damaged by frost. Tender annuals should not be planted outdoors until after the last spring frost. Cold tolerance information is sometimes found on the label of the plant or on signage at the garden center. In addition to knowing the cold tolerance of the plants, it is important that the plants be acclimated (hardened-off) to outdoor conditions. The acclimation process helps plants to adapt to freezing temperatures. 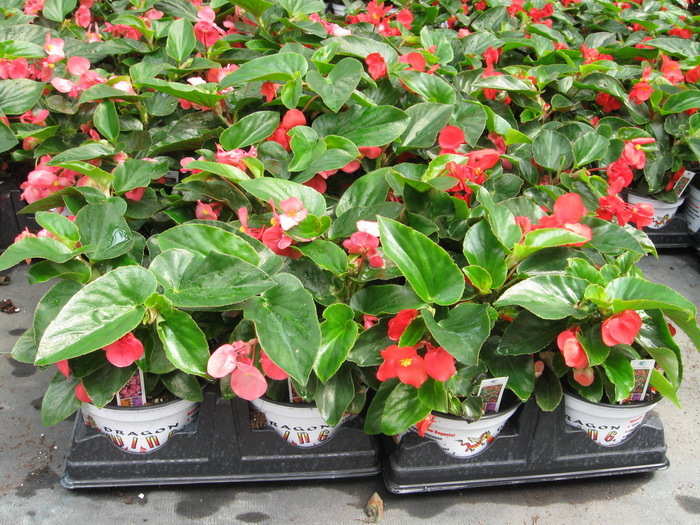 Ask your garden center if plants have been acclimated, or you can acclimate them yourself. To acclimate plants, place them outdoors in a protected area during the day and bring plants back indoors at night for one to two weeks. Providing cool temperatures with limited exposure to wind will acclimate them for outdoors. During the second week, plants can be left outdoors unless freezing temperatures are expected. Here are some guidelines for deciding when to plant flowering plants. Know the average date of the last frost in the spring for your area to use as a guideline for planting. The fact sheet "Massachusetts Frost/Freeze Occurence Data " is available from UMass Extension, or ask your local garden center, or search on-line, “Massachusetts frost free dates”. Flowering plants that are planted in soil that is too wet and cold will not grow, and are prone to root rot and nutrient deficiency. The moisture level of garden soil is considered adequate for planting when it is workable. Workable soil is no longer frozen and it is not too wet. To determine if the soil is too wet to work, squeeze a handful of garden soil in your hand. Workable soil should fall apart easily and not stay clumped together. If it sticks together the ground is too wet to work. Soil temperature also plays an important role. Some plants will tolerate cool soil, while others require warm soil. Measure soil temperature by inserting a soil thermometer about 4" into the ground. Take a measurement in the early morning and late afternoon to get a high and low for the day, then average the temperature readings. Measure soil temperature on sunny and on shaded areas of the garden. Also, the UMass Extension Landscape Message  provides soil temperature information in areas of Massachusetts under “Environmental Data”. Pull back organic mulch (if it is in place in the garden), to allow the dark colored soil to warm faster. Once soil is warmed and plants planted, mulch can be raked back into place. Lay a sheet of clear plastic over the garden area to warm the soil and trap the heat. Remove clear plastic before planting. Note that weeds will grow quickly under clear plastic as the soil warms. Black plastic can also be used to warm the soil and it will suppress weed growth. Black plastic is a little less effective than clear plastic because it absorbs and deflects some of the heat. As soon as garden soil is workable and soil temperature reaches 45°F, bare root perennials and very cold tolerant annuals such as pansies and violas can be transplanted. Soil temperatures between 45° F and 65° F are best for pansies. Pansy roots will not function when soil temperatures are below 45°F. When soil warms to about 65°F (about two to three weeks before frost-free date), cool tolerant plants can be planted, such as nemesia, diascia, snapdragons, alyssum, osteospermum, mimulus, lobelia and petunias. Most potted perennials that have been acclimated can also be planted at this time. Tropical and subtropical warm crops such as alternanthera, angelonia, New Guinea impatiens, lantana, vinca, celosia, cleome, coleus, cosmos, gomphrena, ipomoea, melampodium, portulaca, sunflowers and zinnias should be planted after the threat of frost has passed in warm soils (minimum 68-70°F). These plants are naturally sensitive to cool temperatures and are not a good choice for early spring planting. To get a jump on the growing season and to avoid cold, wet garden soil, try growing plants in hanging baskets, patio pots or other above ground containers. Flowering annuals can often be planted in containers above ground earlier in the season than those planted in the ground. Soilless mixes are used in containers which tend to be warmer and drier than garden soil, especially if containers were recently filled with new growing media that was not kept outdoors over winter. However, air temperature should still be taken into consideration and tender plants should not be planted before the danger of frost has passed. Monitor the weather forecast for all flowers planted in early spring, and if a frost is predicted, cover tender plants with a sheet or cold protection crop cover (commercially available) for frost protection. Without some sort of protection, you are always taking a chance when planting outdoors in early spring and occasionally plants will get damaged. By choosing cool tolerant plants, acclimating plants, planting in workable soil, closely watching weather forecasts and providing extra protection when needed, you will minimize the risk of losing plants. Plant Your Annuals by Soil Temperature . 2013. Prairie Star Flowers Blog. Kansas State University Research and Extension. Wade G.L. and P.A. Thomas. Success with Pansies in the Winter Landscape: A Guide for Landscape Professionals. University of Georgia Extension. Ophardt M.C. 2014. Soil Temperature: Is the Soil Warm Enough for Planting Seeds? Washington State University Extension.